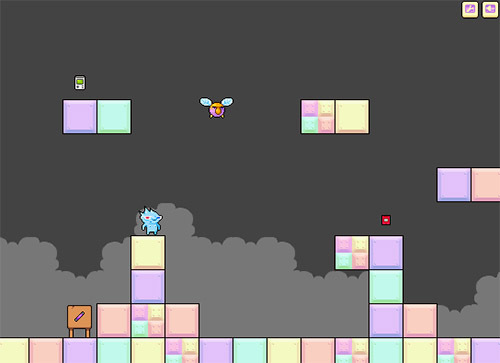 Description Have some fun in the 21 levels of this innovative, pixeled puzzle flash platformer. A colorful game where you need to solve puzzles by using 3D-glasses, guns and a floating device. Collect a gameboy, batteries and a game in each level to complete the level. Controls Move with the arrow keys or WASD (change to WASD under help). Press Shift to open the weapon menu (change weapon with arrows/WASD and then press shift again to close) and Ctrl to shoot/use.